They really are a gem to work with, and since the website build I have also entrusted my Adwords campaign to Pixelrush too. Highly recommended. We are already seeing the affect on business from our new site. I highly recommend their work, as I always do, to any prospective client. Thank you very much once more. We are a high performance digital marketing agency that is driven and motivated by the success of our clients. We won’t sugar coat our advice, we’re here to get you results. Our premium services are for business owners who have a clear vision for success and who no longer accept the constant stress of non-performance. 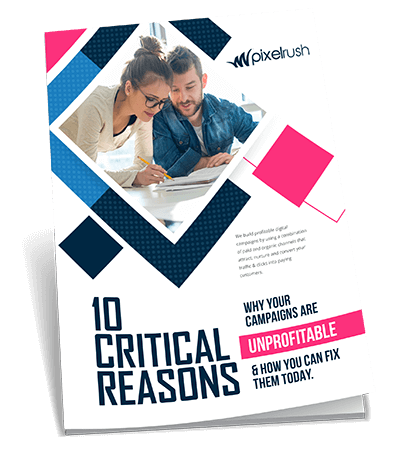 Our campaigns are meticulously crafted, data-driven and we hate wasted spend as much as you do. We strive to create long-lasting, results-based partnershipswith all of our clients. If your business does not grow and thrive, neither will we. We grow your business by focusing on three key areas – consistency, predictability and profitability. And finally, we actually care. As a result, we genuinely focus on the success of your campaign; you’re more to us than just a paycheck, and you’ll enjoy peace of mind with our 90-day performance guarantee. PixelRush Rated 5.0 based on 19 reviews. We used PixelRush recently to do a review of our website and our online presence and we were very pleased with the service received. Byron was extremely knowledgeable and provided us with a thorough analysis which was full of useful advice. The service was timely, professional and the team was great to work with. They also provided a great follow up service and we have no hesitation in recommending PixelRush to others. We service businesses Australia wide and we work with customers from all parts of Australia. Regardless of your location we’re dedicated to providing the highest quality in digital marketing services no matter where you are based.